That won't work unless you can squeeze a few more dimensions into it. I have to say the model is somewhat complex and my opening question is... why? and what exactly does this do to help the standard model of particle physics beyond what it is at this moment. I ask because this is unclear. 1) Matter to Anti-matter asymmetry in the universe. -While neutrino oscillation is pretty much a done deal the theoretical models are still a little bit open for completion. Where this comes in, is that neutrino mass is very very small, and yet their lepton partners are comparatively enormous it begs the questions... what is the absolute neutrino mass scale, and WHY. The current working model for how the neutrinos get mass and oscillate for example is in the so called seesaw mechanism in which you have a very heavy sterile neutrino state which suppresses the rest. This works fine on paper, although it gives an issue of if this extra state is real, without it, the framework that makes neutrino oscillations fit into the standard model doesn't really work properly and neutrino oscillation is an awkward bodged on addition. While again this is a huge unknown, maybe the heavy sterile neutrino is a good candidate... but if not, then we have to come up with a model for a particle that is weakly interacting, massive and neutral and otherwise decoupled other than gravitationally. As i say that heavy sterile is a candidate, though the mass scale is pretty big and some of the models predict that it is of opposite chirality aaaaand that makes it basically uncoupled to regular interaction... searches are either impossible or next to impossible directly. Supersymmetry would work nicely although it is looking disfavoured or not within realistic reach of even the next generation of colliders based upon the data we have from the LHC, the WIMP here would be a predicted stable 'lightest' supersymmetric particle, the neutralino. There are then other models entirely... axions for example... which need a place in the standard model. So the problem isn't readily solved by adding enormous complexity by essentially requiring that once fundamental particles are actually components of different charge. The thing about charge is that a composite object, even though neutral, interacts still because those component parts are charged, just more weakly due to it being net zero. But take the gamma for example, its rather strongly interacting, and is still net zero. I will have to read through the model more but it strikes me as a numerology and pattern finding exercise which doesn't specifically reveal any fundamental truths. Example which possibly breaks the whole notion is this... Why are the angles equal? it doesn't strike me as natural for example for groups of -ve to bunch together on one side of a vertex and +ve on another, the lowest stable configuration would be to reduce in the lowest space charge. While i realize you are not claiming some kind of geometric construct, you are trying to search for a new particle in geometry... which I am not sure I see the compulsion to do. While i realize you are not claiming some kind of geometric construct, you are trying to search for a new particle in geometry... which I am not sure I see the compulsion to do. 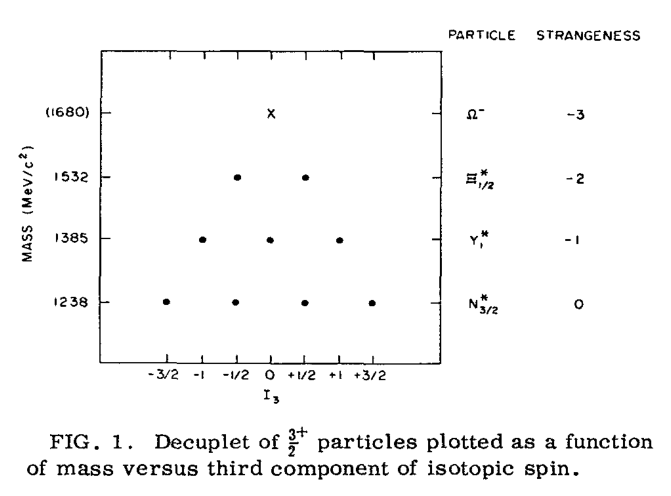 So the geometry in this figure reminds me of the 10 pins at a bowling alley where 9 pins/particles are known, but the #1 pin/particle was unknown/missing, and the paper cited says it might have been found. However this is a very limited application and I think Lisi's failing was trying to lump too much together using a much more complex geometric model than Gell-Mann's SU(3) (though Lisi's approach was also based on a Lie group, E8), which was in fact one of the criticisms leveled at Lisi's approach by other physicists who looked at what he was trying to do. I took the word as is. Like a silly bugger. Looked it up. Maybe if you had searched something like "nintendos pass through everything" you might have found this script, this is where I heard it, but I'll bet even if Eros had never heard this script before and you asked him "what are those particles called that pass right through you, nintendos?" he would guess what was meant, because he knows those particles. Well look at these readings, sir. These are leptons. That means something inside this pyramid is slowing down neutrinos. Normally neutrinos pass right through ordinary matter, no matter how dense. I mean, something like five hundred million billion just passed through you. I'll authorise a standard recon mission. Colonel I can only guess the effect this type of radiation may have on the human body. I recommend limited exposure, ten, fifteen minutes at most. Hey. If you'd been listening, you'd know that Nintendos pass through everything. So there are at least two reasons he says that. First, his character has a personality trait that he pretends to be less smart than he is, so he might pretend to mis-remember the word even if he really remembered it. (The "no matter how dense?" is another self deprecating remark with dual meaning.) And second, of course for the comedic effect where science buffs who also remember the correct word might think it's funny when he calls them Nintendos. It needs the last of my diagrams adding. Which need colouring correctly as green for (fw, bw), blue for (up, down) and red for (left right). They are on the outside of the cube. (Hard to draw). My model is not complex. I have arrived at it from a different angle. It will help because it is a different view. As, my model gives information of the charges and colour charges of all the standard model particles. After i had finished my last diagram/pic. I could of wiped all my charges off. And label all the particles as known by their names. Arbitrageur wanted me to do that i think. But. Isn't better to have other comparative information if available? I don't see why my model isn't helpful. This model was reached because of the D/S experiment. And my refusal to believe in magic tricks. Not pointing fingers at any person. But an illusion we were shown by quantum itself. To prove it was a wave and should be represented as three parts in propagation. Not one solid photon. when i tried to prove it. I found the quarks. They're named wrongly. I figured them out. It wasn't easy. And i don't agree that i used numerology. But logic. So now i felt i could prove the wave action as opposed to single photon. But then had to prove that too. I only set out to explain the D/S exp initially. But. If my model can help. Then it's useful. I have no idea how you will prove DE. But i believe it is part of my model. I love the inventive way it is searched for. And every time it doesn't confirm. Is hopefully. A step closer to proving it. Good luck with the search. If i thought i could suggest anything useful. I would. But i'm lost on how to help. Your questions of why? in the next to last paragraph. I can't answer why. I get the joke now. I'm not sure i agree with Lisi's Lie group e8 as described. If he used the word "region". That might be better. For me. Or. Not include it. Although. I might be wrong of course. I have been thinking about your remark on numerology. You aren't the first to mention it on this thread. 18 was the number i needed to explain my three parts D/S exp. The exp is in 2d. Reality is in 3d. I had 3 parts of a 6 direction model to prove. 3 parts x 6 directions was already a combination of ways how to make 18. The combinations are natural. They occur throughout nature. Any similarity to numerology is purely coincidental. Yes, yes. But what are the subspatial vectors?